It’s the end of 2012 and with a year like the one we just had, we felt it would be fitting to look back over some of the highlights. We hit the ground running with a feature on Imaginary Forces’ panopticon title sequence for AMC’s short-lived TV series Rubicon, followed closely by our first video game feature: an in-depth look at Goldtooth Creative’s innovative mixed media main titles for Eidos Montreal’s dystopian cyberpunk adventure Deus Ex: Human Revolution. Then, of course, came our comprehensive breakdown of Blur Studios’ meticulously crafted main titles for David Fincher’s The Girl with the Dragon Tattoo. Featuring interviews with Fincher, Blur creative director Tim Miller, and designer Neil Kellerhouse, the Dragon Tattoo feature was an article that we were all particularly proud of, and one that fulfilled the original vision of the site. In between the larger articles, we continued with our extended examinations of the work of design legend Saul Bass, and tackled everything from small town hockey in Les Bleus De Ramville, The Inner Workings – a look at title sequences that featured microscopic visions of the mechanical and organic, PostPanic’s sci-fi infused titles for the 2011 OFFF festival, and the beat ’em up introduction to the world of The Warriors. We were determined to bring you not just more content, but more exciting content, and to present it in a more beautiful and engaging way. With that in mind, we worked for many months on the redesign of the website, which launched in July. Helmed by the veritable wizards at Cactuslab and with initial UX/UI help from Sabih Mir, the redesign allowed us to showcase the fine cinematic work of our features in a more intelligent, readable, and comprehensive way. A custom CMS called Supermodel was also implemented for the backend of the site which helped us work more fluidly and collaboratively. At the same time, we also switched to full video hosting through Vimeo's "Pro" service and now our content delivery to both desktop and mobile devices is more solid than ever. 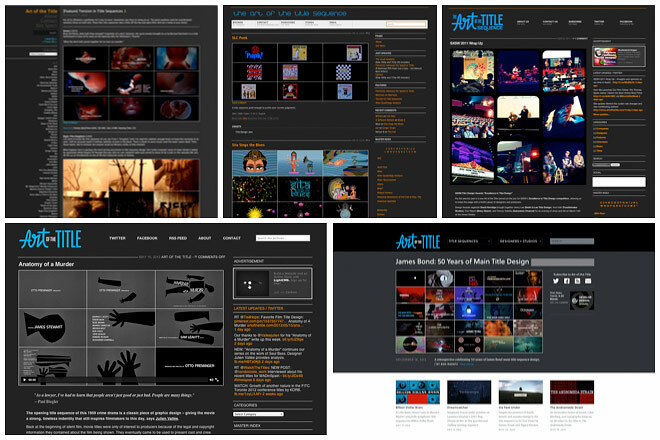 Previous versions of the Art of the Title website. Post redesign, our efforts continued, including an article covering Imaginary Forces’ title sequence for HBO’s prohibition era drama Boardwalk Empire (the second of two major interviews with IF creative director Karin Fong), a lengthy analysis of Kyle Cooper’s form redefining title sequence for Se7en, a retrospective look at the intro for David Lynch’s cult TV series Twin Peaks, some tremendous new work from the creative team behind the main-on-end titles for Crave, a highly entertaining chat with filmmaker Drew Goddard and the team at PIC Agency about the main titles for The Cabin in the Woods, and a feature/interview centered on Danny Yount and Digital Kitchen’s haunting and macabre title sequence for HBO’s Six Feet Under. In total we published a whopping 42 articles about title sequences and four major features including the recent, extensive James Bond: 50 Years of Main Title Design, and an in-depth David Fincher retrospective, which received more than 40,000 views. We travelled to New York as a juror for the annual Type Director's Club competition in January, then Austin, TX in March to participate in SXSW’s “Excellence in Title Design” competition as a jury team for our third consecutive year, sharing the stage with a terrific group of designers and filmmakers including Kurt Volk (Troublemaker Studios), Ben Radatz (MK12), and Gareth Smith & Jenny Lee (Smith & Lee Design). Editor-in-Chief Ian Albinson presented a highlight reel of the jurors’ work, and then led an informal 40-minute discussion with the designers. We also curated the title design section of the Graphic Design—Now in Production exhibition which travelled from Minneapolis, to New York, and finally to LA. 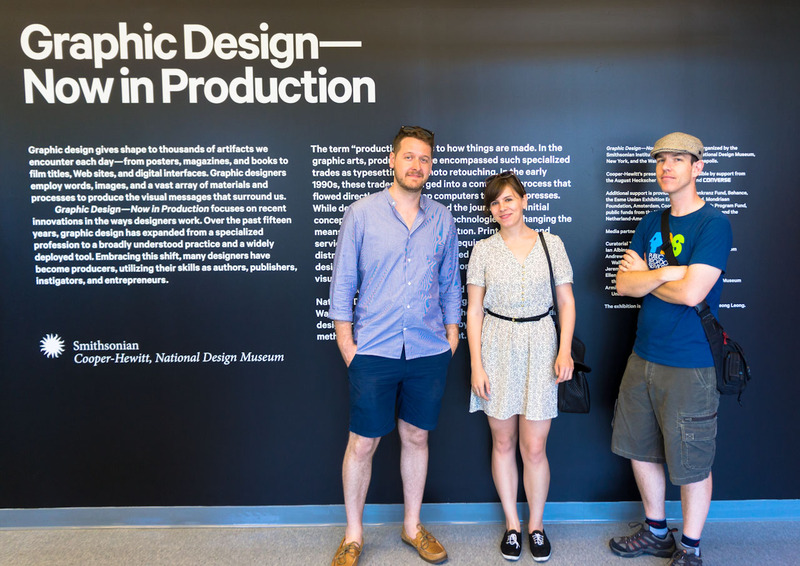 Graphic Design: Now in Production in NYC. I love the site. It's really beautiful. I would much rather have anything and everything about the title sequence be on Art of the Title than in USA Today or any publication like that. Your site is the proper context for this conversation. That might be my favorite interview I've done on Cabin. Beautiful work. Art of the Title, the highly-respected and essential website devoted to title design in film and television, has chosen to spotlight Crave today with an in-depth look at Raleigh Stewart’s imaginative and amusingly disturbing credits for the film. As Criterion is to home video and Cinefex is to visual effects, Art of the Title is to title design. To say I’m honored is a colossal understatement. It should be noted that our Game of Thrones feature/interview was not actually published this year, but in May 2011. The enduring popularity of the article is a tribute to the fantastic work of Angus Wall and the team at Elastic. Unsurprisingly, our top location was the United States, followed by the United Kingdom, Canada, France, Germany, Spain, Australia, Brazil, Italy, and Japan. Our highest referrals were from Facebook, Motionographer, Twitter, Reddit, Google, Stumbleupon, Vimeo, Wikipedia, and lastly Videocopilot. Speaking of social networks, we ended this year with 22,445 likes on our Facebook page and 12,525 Twitter followers. Thank you, as always, for your continued support – we couldn’t have done it without you, you handsome devils. Of course, we’d also be remiss if we didn’t acknowledge the team of contributors that make this site and its content possible. Thank you to Jonathan Dube, Shaun Mir, Angel Tagudin, and especially MK12 Creative Director Ben Radatz. So what will 2013 bring, you ask? Well, look for our usual in-depth coverage of Laika's ParaNorman main-on-end titles, Momoco's playful graphic work for An Education, Smog's fluorescent end titles for Joven y Alocada (Young and Wild), and a retrospective of the great Richard Greenberg – whose seminal title work includes Superman, Alien, The World According to Garp, Altered States, Dirty Dancing, and The Untouchables. For all you production aficionados, we're also planning detailed breakdowns of Picture Mill's Panic Room, PIC Agency's titles for The Kingdom, a double bill of Tron and Tron: Legacy, as well as, with luck, Watchmen. In addition to expanding our horizons with a renewed focus on international fare, we’ve also got a number projects on the go that we can’t speak about just yet, but which we are sure will knock your socks off. Stay tuned!